The word `avadana' in Sanskrit means good, noble, illustrions or heroic act. A section of Buddhist literature is called `Avadana' because it deals with the tales pertaining to the noble, illustrious or heroic acts of the Buddha or any of his disciples. Through the medium of these tales which were mostly drawn from the folklore of the time, the Buddhist scholars tried to preach the people the law of karma by presenting before them the examples of these tales. The Sardulakarnavadana is an Avadana par excellence. Through the well-known story of Prakrti, a canda girl and Avadana, an ardent disciple of the Buddha, this Avadana propagates the order in society based on worth rather than birth. It also has a vast store of contemporary knowledge regarding the constellations, stars, planets, omens, dreams etc. and their assumed effect on life on earth. A comparative and analytical study of the same has been presented in this book in a classified manner. Born in U.P., the author was brought up and educated in Delhi. She obtained her Ph.D. degree from the Department of Buddhist Studies, University of Delhi, Delhi. She is working as a Reader in the Department of Sanskrit at Vivekananda Mahila College, (University of Delhi), Vivek Vihar, Delhi. Her interests include folklore, women's education, population education besides the Buddhist Studies. She is a sensitive person with literary taste which results in her writing plays and poems. She has many books and research articles to her credit. The period of 7th-6th centuries B.C. is of considerable importance in the history of north India. It marked the transitional stage not only in the political field but also in the life and thought of the people. The elite trend was now growing against the rigidity of the Vedic sacrifices. The economic progress and the mental stir of the age was responsible for this change.' In the philosophy of the Upanisads we notice a growing ferment for true knowledge. In place of the elaborate and expensive Vedic rituals, the mind of the' thoughtful people was diverted to the attainment of peace and salvation by the know-ledge of Jima'? and Parmatman. The high position which the Brahmana priests had so far enjoyed could not longer be maintained. By the 7th cent. B.C. the Ksatriyas had gained predominance.2 Some of them were recognized philosophers. Even the learned Brahmanas used to approach some of them for seeking higher learning. The examples of philosophers like Pravahana Jaibali, Janak and Ajatasatru are before us. The first mentioned king used to hold intellectual discussions at his court in Kampilya. From the Brihaddrattyaka (IV, 1, 1) and the Chandogya (V, 3, 1) Upanisads we learn that svetaketu, son of Uddalaka Aruni, went to the assembly of this king. Jaibali asked him several searching questions about the nature of soul and other world. Svetaketu, however, failed to give satisfactory answers. On his return, he conveyed this to his learned father, Uddalaka Aruni. Thereupon, both the father and the son went to king Jaibali, who gave them necessary instructions in higher knowledge. It should not be supposed that the Vedic rituals were totally ignored in this age of reason and higher learning. They, no doubt, continued, but in a less vigorous and popular form. The theology, as contained in the late Vedic literature, was still current. Mystic significance was attached to the Vedic rituals and sacrifices. In the grauta sutras and Grihya sutra, we come across elaborate descriptions of some Vedic rituals. Many Brahmanas were still earning their livelihood through these yajnas. They were patronized by kings and the rich classes. This state of affair continued at the time of the Buddha. There was probably no central organisation of the Brahmana-priests just before the time of Gautama Buddha. There were no temples of theirs, where people could congregate. In the absence of such centres the common folk used to worship trees in the form of vriksa devatas (tree-gods). Besides, the Naga-cult was also prevalent. The Nagas (serpents) were supposed to live, like mermen and mermaids, under waters. They could also assume human forms and people were afraid of their strength. The Nagas were worshipped both in the form of serpents and human beings. Then come the Yaksas and the Gandharvas. The Yaksas and their consorts were very powerful. In MadhyadeSa they had several centres, notably at Mathura and Alavi. Kubera was the lord of the Yaksas. He was regarded as the god of wealth. Some of the Yaksas and Yaksinis were cruel and fearful, while others were of pleasant forms, mild and benevolent. The ancient literature contains numerous references to the Yaksa worship. 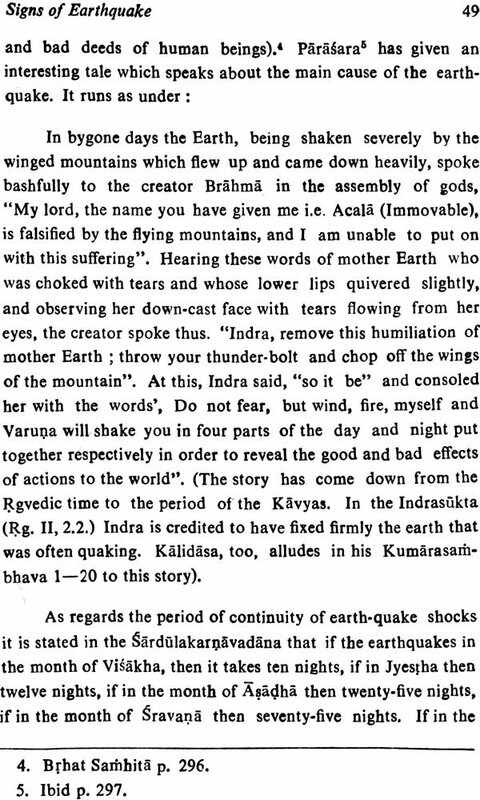 In the Mahabharata we come across the Yaksas, one of whom is said to have asked some questions (Yaloaprasna) to Yudhisthira. From the Buddhist and Jaina literature we learn that the Yaksacult had a wide popularity in the northern India. We read about the names of several powerful Yaksas, such as Umbaradatta, Surambara, Manibhadra, Bhandira, gtilapani, Surpriya, Ghantika and Puma Bhadra. Similarly, we come across such names of the Yaksinis as Kunti, Nap, Bhatta, Revati Tamasuri, Loka, Mekhalri, Alika, Benda, Magba and Timisikd etc. People were afraid of them and used to pay homage to these so-called semi-divine figures. The last mentioned four Yaksinis belonged to Mathura. According to the tradition they were restrained by Buddha from their unpleasant deeds. The Yaksa called Gardabha was at that time quite powerful at Mathura. Buddha succeded in subduing him and relieved the people of Mathura from the constant fear of this Yaksa. Similarly the great Yaksa of Alavi was also humbled by the Buddha. I have great pleasure in introducing to the world of scholars Dr. Sharmistha Sharma's work : "Astrological Lore in the Buddhist gardfilakaruavaddna". 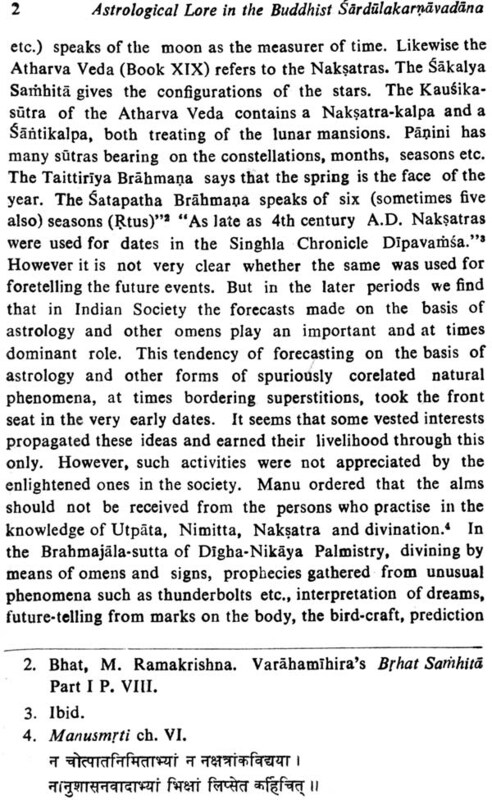 Astrology has had wide acceptance in India since times immemorial, the followers of even of the faiths the founders of which had criticised it practising it assiduously on the ground ostensibly of people's wellbeing. There was no let up in its per-suit in spite of its having been declared by the leaders of the society of their time as inferior discipline. It is on record that the Buddha did not like it. Nor did he like such persuits as numerology, omenology, the dream explanations and so on. But it is a fact that all these have continued to be persued by his followers not only in India but well beyond its shores. Their appeal transcends all faiths, castes and creeds. The inquisitive-ness to know the unknown is ingrained in human nature. If the stars could foot the bill, they are welcome. A look to them, their position, movements and nature are then the subjects of study to unravel some of the mysteries of human existence. It looks some people in the most ancient period would have noticed changes in the human plane along with changes in the astral one. Given to reasoning that the human mind is, they would have drawn the conclusion after repeated observation of the phenomenon that there is connection between astral and human movements and that human moves could be foreseen. with the astral moves. 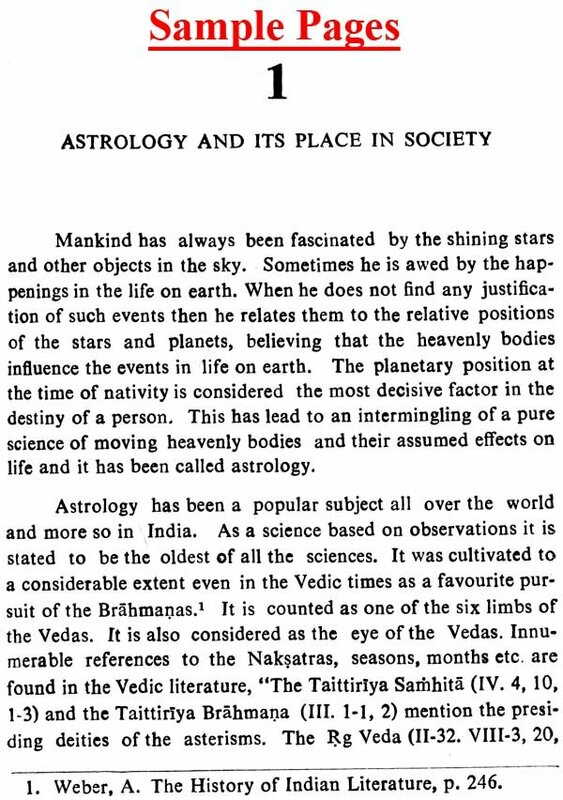 This is how the science of astrology would have developed, and also omenology and numerology. And as and as the forecasts came true the effectiveness of these disciplines took deeper and deeper roots till these came to assume the shape of sciences resting on the principle of cause and effect, a pre-requisite for any discipline to earn the appellation of science. There appeared over the centuries good texts on astrology, numerology, numerology, palmistry and so on, besides numerous references to them in other texts. To the second category belongs the sardulakarnavadana. The work is introduced with two stories the link between them being a girl who is common to both in different births nevertheless. She is Prakrti in one who takes fancy to the monk Anand, the chief disciple of the Buddha while offering water to him and wants to marry him and the daughter of a Brahmin Puskarasarin in the other whom the Maitanga king Triganku wanted for his son sardulakarna. 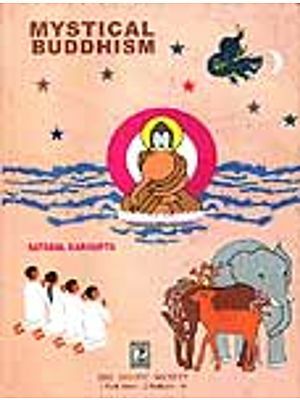 The objection of Puskarasarin on the ground of the caste distinction, he being of the high caste and Trigafiku being of the low one having been countered by the latter on the basis that respectability goes with work and not birth and that he is as knowledgeable as any one from the higher castes, the former (Puskarasarin) puts him a number of questions about constellations, stars, planets, omens and so on to which he satisfactorily answers making the former (Puskarasarin) change his mind and agree to the latter's (Trisanku's) proposal for the hand of the former's daughter for his own son sardulakarna. Since all this knowledge flows out for the sake of sardulakarna, the work is named after him. Dr. Sharmistha Sharma analysis this knowledge, classifies it and presents it to the modern reader in a clear and lucid expression. This she would not have able to do unless she would have herself acquired thorough knowledge of the varied disciplines. Her study reveals her in-depth approach to the large technical material embedded on the sardulakarnavadana. For this she deserves rich plaudits. A section of Buddhist literature is called avadana. The avaddnas are the tales told by the Buddhist monks to the audience of the common folk in order to attract their attention to the religion of Buddhism. These monks used to move from one place to another to collect alms from the householders and also to preach religion to them. They conveyed the message of their religion in many ways. One of the quite effective ways of popularising their religion was through the medium of these tales. Most of these tales were drawn from the folklore and the legends of the time. The sardulakarnavadana is an avadana par excellence. It relates to the popular story of the love of a low-caste girl, named Prakrti, for a Buddhist monk, named Ananda. This story stresses upon the Buddhist belief in the equality of men as men and blasts all claims of superiority by any section on the basis of mere birth. While refuting this claim of superiority on the basis of birth, a low-caste Trisanku demonstrates his wisdom in the field of astrology which is supposed to be the domain of the high-caste Brahmanas. While doing so he ex-presses a vast treasure house of the knowledge about the astrological lore prevalent at that time. The material available in this avadana is very interesting in the light of similar material contained in other works like the Angavijja (Jain text) and the Brhat Sarithita (Bramanical text). This avadana was claimed to be translated into the Chinese language in 170 A.D.2 "Parts of the narrative are of considerable interest, and, whatever we may think of the date of some of the later chapters, the frame-work of this avadana itself must be of great antiquity. It was certainly translated into Chinese in the third century of our era. "3 Its popularity can be gauzed by the fact that "there are four Chinese translations of the same or a similar text on the History of Prakrti, the Matanga woman. "4 The famous dance-drama 'Canclalika', based on the story by the Noble-prize-winner Dr. Ravindra Nath Tagore had its roots in this very avadana. Regarding the place of the origin of the sardulakarnava-dana one may only guess. There are references to the units of measurement like the Magadhayojana, the Magadha-prastha, Magadhaka-Tula. The variations in the durations of day and night during extreme conditions of winter, summer and rainy season have been mentioned to be between twelve and eighteen Muhiirtas. 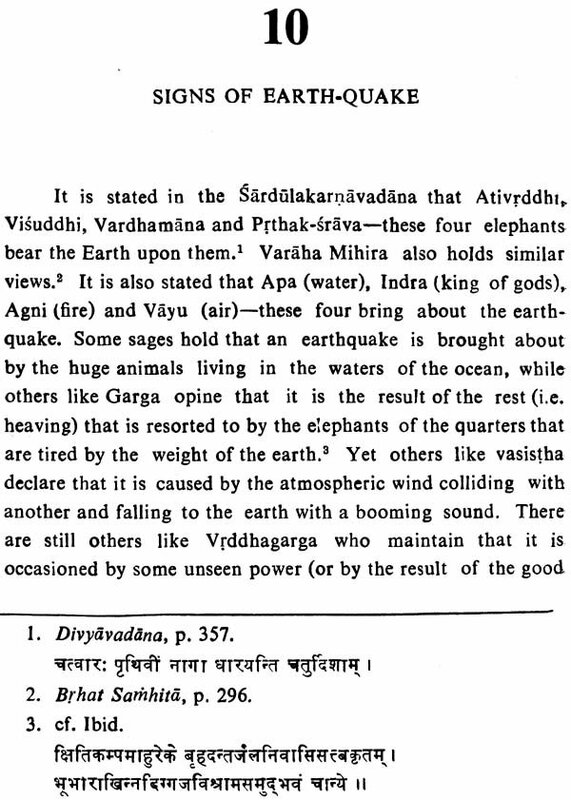 This suggests that the place of origin must be close to Magadha. In the present book the astrological lore, the folk beliefs and the scientific information as gleaned from the sarddulakarnal-vadana have been given. This lore is compared with the similar contents of the Brhat Sarhhitd of Varahmihira (500 A D.). A critical appraisal of the scientific information, in the light of the current knowledge, is also incorporated at the appropriate places. It is hoped that the readers will appreciate the high level of knowledge available in the bygone era. I am deeply endebted to Prof. K.D. Bajpai, Tagore Pro-fessor, Sagar University, Sagar, for his encouraging attitude towards all my scholastic pursuits. My special thanks are due to him for his kindness in writing an introduction dealing with the background of the avadanas. My heart-felt thanks are also due to Prof. Satya Vrat Shastri, Professor of Sanskrit, University of Delhi, Delhi and Ex-Vice Chancellor, Shri Jagannath University, Puri, Orissa for his keen interest in my work and also for writing foreword to this book. I owe my thanks to Shri Shamlal Malhotra, Proprietor, Eastern Book Linkers, Delhi-7 for printing and publishing this book. My thanks are also due to my husband Prof. Rajnish Prakash, Principal, Punjab Engineering College, Chandigarh for his immense sup-port and help. I take this opportunity to register my feelings of great appreciation and thankfulness to my son Himanshu and daughter Ruchi for their co operation.